Lobster can be served simply steamed, broiled, or baked, with its meat dipped in melted butter. To add a note of class, blend its delicately sweet meat into everything from macaroni and cheese to a Lobster and corn chowder. Here are some of our favorite ways to prepare this luxurious summertime staple. 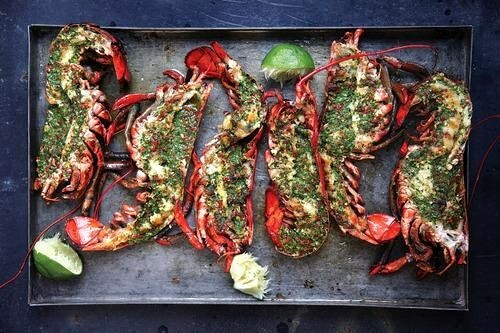 Rich, herbal cilantro butter spiked with chiles is the perfect dressing for elegantly simple grilled Lobster. Build a medium-hot fire in a charcoal grill or heat a gas grill to medium-high. (Alternatively, heat a 12" cast-iron grill pan over medium-high heat.) Place Lobster halves (flesh side down) and claws on grill and cook for 5 minutes. Turn over Lobster halves and claws and spread each with some of the cilantro-chile butter; continue cooking until cooked through, about 3 minutes more. Serve with lime wedges.